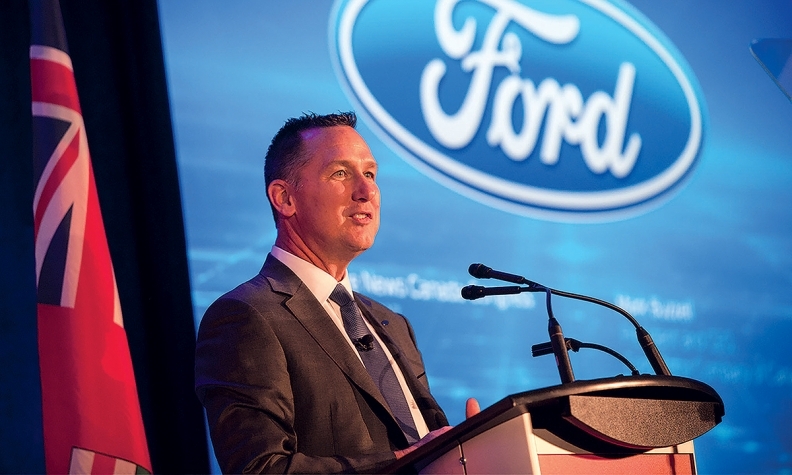 Mark Buzzell officially became Ford of Canada CEO on Jan. 1, 2017. Early in his campaign, U.S. President Donald Trump put American-based companies on notice, warning manufacturers — especially automakers — that moving production outside of the United States would come at a cost. Before Trump was inaugurated, Ford decided to increase its investment in the United States over Mexico or Canada, although during 2016 contract negotiations with Canadian union Unifor the automaker agreed to spend CDN $713 million on upgrades at its Ontario facilities. In an interview with Bloomberg TV Canada’s Amanda Lang, Ford Canada CEO Mark Buzzell explains why the automaker made the investment decisions it did and where he sees growth opportunity. “With us and our dealers, we think there’s a some op to play a bigger role in the parts arena, so we’re looking at ways to do that,” Buzzell said. Buzzell said there will come a day when the industry isn't selling 17 million vehicles in the United States and two million in Canada each year. “Then, all of sudden, the fixed operations, the parts sales and used vehicle sales become a much more important part of the business,” he said.